to diagnose your unhealthy declining trees. Tree disease and sick trees can happen without warning. If you have notice your trees changing color before the autumn season it's time to call a certified Arborist to evaluate for insect borer beetles and tree disease. Our Fort Worth, TX tree doctoring team is ready to help you in all season! Do you have sick trees or diseased looking trees? Have you noticed your trees losing their beauty? Bark looking black or white in areas? Leafs turning a yellowy color before fall? We train our clients to spot tree disease on their plantation. Our Arborist team has the right knowlage when it comes to unhealthy shrubs and trees. 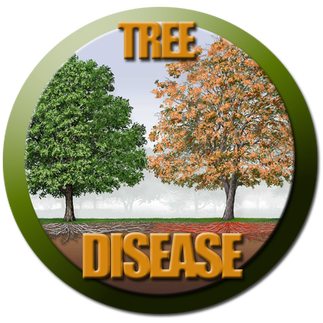 Call (817) 502-9402 Identifying tree disease for the past 20 years . Identifying tree foliar systems on the leafs is very important! This is where you will be able to first tell there is a problem or disease and should be diagnosed before it becomes a major tree or shrub health issue and results in the decline or death of the tree. Tree sickness can be treated be using systemic tree feeding, systematic deep root feeding, and tree injections if caught early. 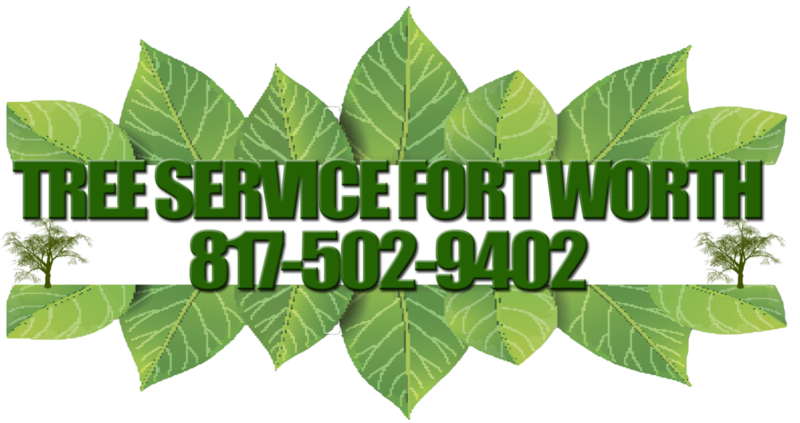 Tree service Fort Worth would like to help you spot problems and educate you on what to do. 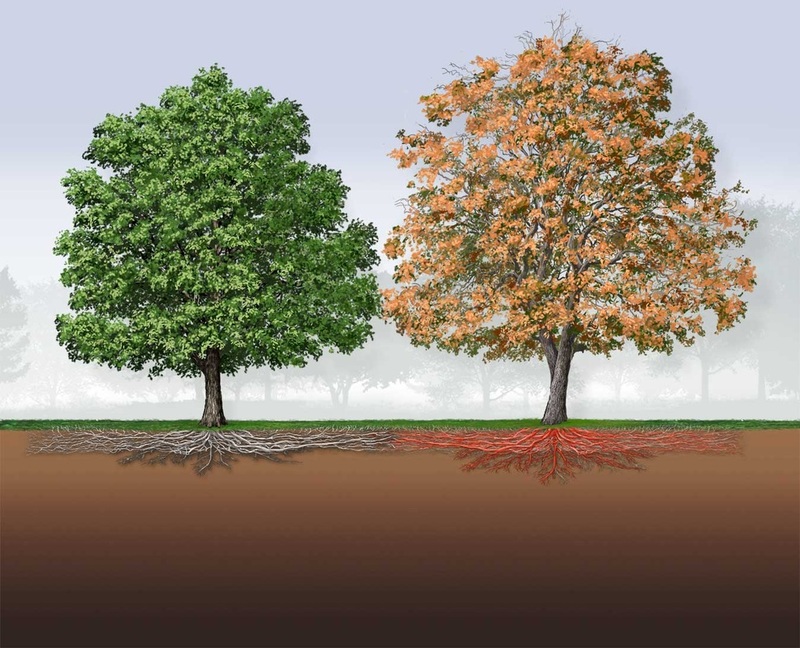 We offer many solutions to treating Oak trees, Post Oaks, Live Oaks, Bur Oaks, Elm trees, Bradford pair trees, Red Oak trees, Cedar Elm trees, Baldcypress trees, Anacua trees, White Ash trees, just to include a few of the common sick trees we treat for decline. All of these trees can come under disease that fall under three declining categories: Infectious, non-infectious and insect infestation. Having a trained eye to sick declining trees is important due to the fact that most signs of tree decline can seem to be the same symptoms. RED OAK: Is very referent from Live Oak trees and spotting issues is a little more complex. Here are some of the noticeable signs of trouble with the tree. During the spring time, you will see that the leafs don't bloom like other trees. They will wilt, not open and turn a brown or a pale green color and wither away. This normally starts on one side of the tree and soon after, the whole tree is effected. If a Red Oak does not bloom normally, you have a major problem and need to call an Arborist quickly to diagnose. 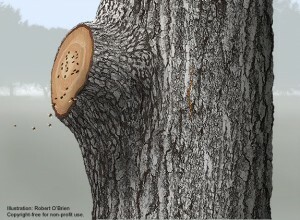 If the tree has Oak wilt it will die in a matter of three to four weeks. If you notice during any season that the tree has developed fungal spores on the bark, you definitely have a problem and it could very well be Oak wilt. You will have to inspect your trees frequently, in Red Oaks, sometimes the Fungal is hidden behind the bark so a close inspection will be needed. Normally fungal spores will have a fruity smell to them. In Live Oaks with Oak Wilt spreads the disease through their root system. Live Oaks normally grow in a group called Oakwoods and their root system inter-tangles with one another. When one tree get effected its only a matter of time before the rest of the trees get infected. This is why it's important to treat the infected tree at first sight of the disease, before infestation takes over the whole plantation and your loss is huge. Remember any tree looking brown and not responding to its season correctly will have to be evaluated immediately. Red Oaks: transmit oak wilt through the land contamination and normally will need a host to carry the disease to another tree. It has been proven that when a red oak produces fungal spores, they let off a fruity scent that attracts all kinds of bugs and insects. 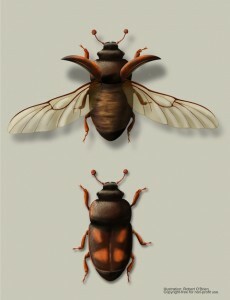 One of these bugs is the sap-feeding nitidulid beetles in the picture above. All pictures on this page provided by: http://texasoakwilt.org/oakwilt/oak-wilt-spread/ great source for information on Texas Oak Wilt. This disease is caused by fungi and water molds that decay the root trunk tissue. 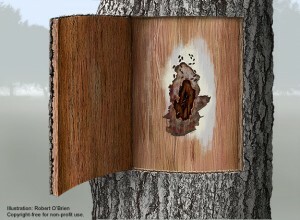 This is caused by a wound to the tree at some point that protruded into its tissue core. Bacterial leaf scorch (bacterium Xylella fastidiosa) is caused when the summer time comes and the tree is under stress from the heat. This bacteria lives in the water xylem of the tree and normally is transmitted by insects that feed off of the Xylem. The tree is stressed over time and die back starts to take place until the tree completely shuts down and dies. 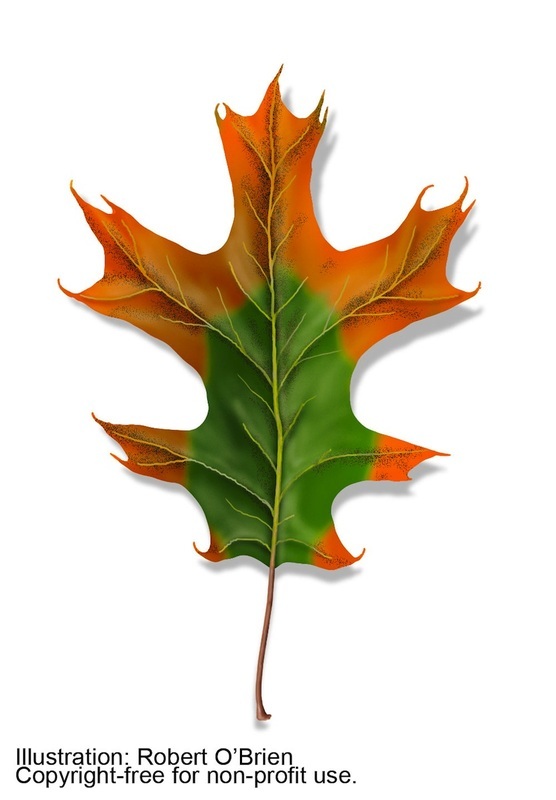 The scorch on the leafs look like a yellowy brown and at times can be mistaken as Oak Wilt.